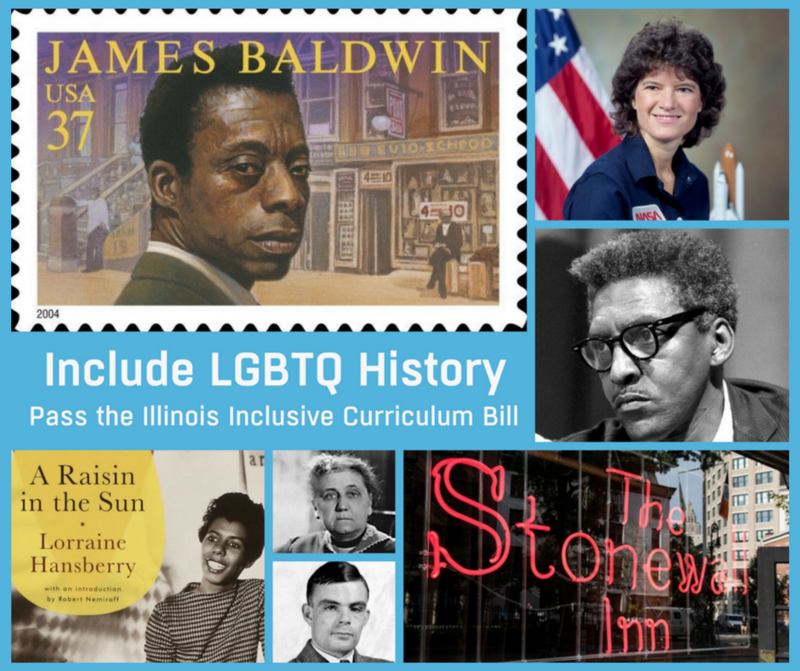 SPRINGFIELD (February 16, 2018)–Students in Illinois would learn about the significant historical events and contributions by LGBTQ people under the Inclusive Curriculum Bill introduced in the Illinois legislature, according to Equality Illinois and the Illinois Safe Schools Alliance. The Inclusive Curriculum Bill, SB 3249 and HB 5596, was introduced late Thursday and is sponsored by state Sen. Heather Steans of Chicago and state Rep. Anna Moeller of Elgin. The bill is an initiative of Equality Illinois, the state’s civil rights organization for lesbian, gay, bisexual, transgender, and queer Illinoisans, and the Illinois Safe Schools Alliance, which promotes safety, support, and healthy development for LGBTQ students in Illinois schools. The Illinois School Code already ensures inclusion in history curriculum of the contributions and experiences of other historically marginalized communities, including of people of color, women, immigrant communities, and people with disabilities, so SB 3249/HB 5596 is consistent with current state law. This curricular approach is consistent with our shared values of inclusion and respect that have made Illinois the civil rights leader in the Midwest. Equality Illinois and the Illinois Safe Schools Alliance thank Sen. Steans and Rep. Moeller for leading this effort to ensure that students in Illinois are taught the whole picture of history. The Inclusive Curriculum Bill will be a key lobbying component of LGBTQ Advocacy Day on April 11 in the Illinois Capitol. Since there is no requirement to include the roles and contributions of LGBTQ people in the Illinois School Code, the historical representation of LGBTQ people, events, and contributions is not discussed in most classrooms across the state. “We should be proud of this history. Instead, the teaching of history has been set a little too straight. Our identities have been erased by omission. Now, it is time for our public schools in Illinois to tell the whole story,” Johnson said. An inclusive curriculum can have positive, affirming benefits and help counteract some disturbing trends. Sadly, in schools across Illinois and the United States, LGBTQ students are told, through bullying, harassment, and exclusion, that they do not belong. These conditions have created a school environment where LGBTQ students are forced to hide their identity simply to protect themselves. According to the 2015 School Climate Survey by GLSEN, a national organization supporting LGBTQ youth in schools, 89 percent of LGBTQ students in Illinois have heard the word “gay” as a slur. And only 27 percent of LGBTQ students were taught anything positive about LGBTQ people in classrooms. Inclusion of LGBTQ history in curriculum can have a positive effect on the educational outcomes and success of students. Nationally, more than 75 percent of LGBTQ students in schools with an inclusive curriculum said their peers were accepting of LGBTQ people (compared to just 39.6 percent of those in schools without an inclusive curriculum). LGBTQ students in schools with an inclusive curriculum also say they were less likely to say they might not graduate high school. SB 3249/HB 5596 would include the contributions of LGBTQ people in the teaching of Illinois and American history, make awareness of LGBTQ contributions to society part of school curriculum in Illinois, and ensure that instructional materials are non-discriminatory and accurately reflect Illinois’ diversity. SB 3249/HB 5596 is modeled after existing provisions in the Illinois School Code that ensure the inclusion of the contributions of historically marginalized communities as well as on a similar law passed and adopted in California in 2011. Illinois would be only the second state in the country to ensure inclusion on a statewide level of the contributions and roles of LGBTQ people in curriculum.